RC.163 Nursery to VII class English Medium TS DSE Permission. 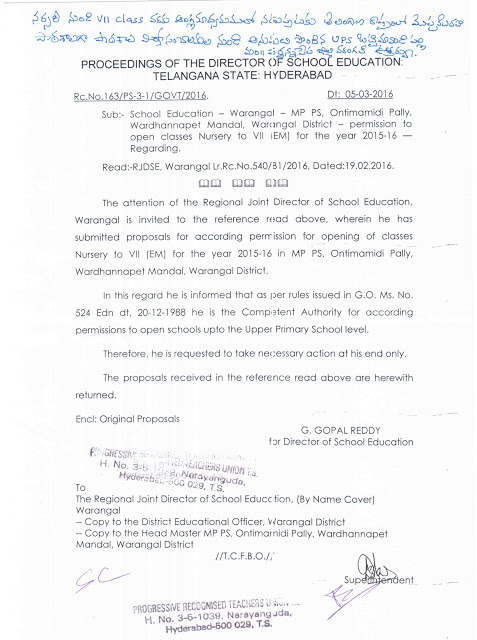 Permission to open classes Nursery to VIII(E/M) for the Year 2015-16 - Regarding. RJDSE Warangal Lr Rc.No.540/B1/2016, Dated:19.02.2016. 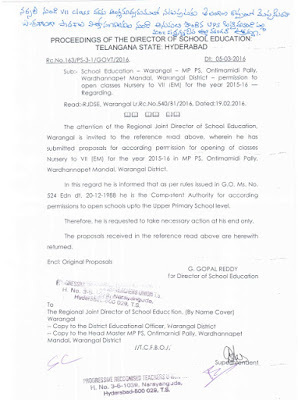 The attention of the Regional Joint Director of School Education, warangal is invited to the reference read above, wherein he has submitted proposals for according permission for opening of classes Nursery to VII [EM] for the year 2015-16 in MPPS OntiMamaidipally, Wardannapet Mandal, Warangal District. In this regard he is informed that as per rules issued in G.O. Ms. No. 52, Edn dt. 20-12-1988 he is the Competent Authority for according permissions to open schools upto the Upper Primary school level. Therefore, he is requested to lake necessary action at his end only.